The following article by Alexander Weatherson appeared in Newsletter 126, October 2015, pp.7-11. 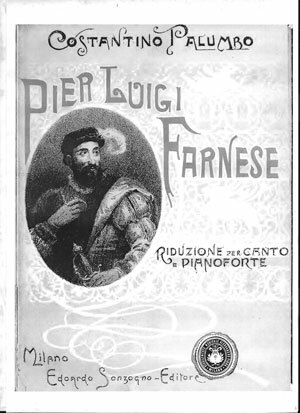 Intended for Rome, Pier Luigi Farnese was despatched to a limbo only conceivable in the lee of the Vatican. Spartito and libretto printed, its cast assembled on stage, rehearsals begun, costumes and sets almost ready, it vanished from the radar. This ambitious Dramma lirico in quattro atti with a bold text by "Tobia Gorrio" (i.e. 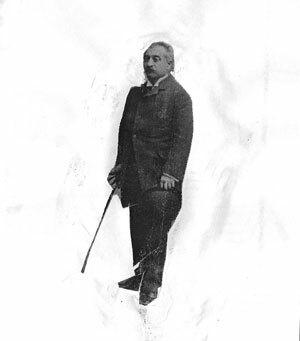 Arrigo Boito), with a hyper-elaborate score by the celebrated Neapolitan pianist-composer "Costi" Palumbo (1843-1926), proposed for the Teatro Costanzi in the brand new capital of Italy, endorsed and encouraged by the radical publisher Edoardo Sonzogno of Milan and with the baton of the famous conductor Leopoldo Mugnone still poised in the air it simply disappeared across a musical Styx never to be heard of again. Whatever could have been the reason? Who or what could have invoked such an interdiction? The date was 1891. It was the year after Sonzogno's momentous competition for operatic advance had come to fruition with Cavalleria rusticana and the arrival of that which became known as Verismo. It was a year of great import for Leo XIII - the liberal pontiff self-imprisoned in the city over which his predecessors had once presided and who had just issued his encyclical Rerum novarum which addressed for the first time social inequality and injustice, issues with which Papal authority now took a turn. It was a moment, in fact, when liberal aspiration, political emancipation and artistic freedom found themselves in anachronistic conflict. What is it the history books say? "Scheduled for the autumn of 1891 at the Teatro Costanzi, Rome, Palumbo's opera never got beyond the dress rehearsal because of a dispute between the composer and the publisher Sonzogno...," "Nor was it ever staged:" [Nardi p.376]. "l’anno successivo Palumbo intraprese un nuovo ambizioso progetto operistico, ottenendo la collaborazione di Arrigo Boito per il dramma lirico in quattro atti Pier Luigi Farnese; dopo una travagliata gestazione, durata circa quindici anni, nel 1891 l’opera venne messa in cartellone dal teatro Costanzi di Roma, ma non andò mai in scena per motivi mai chiariti." 1. Pier Luigi Farnese (1503-1547) Scion of a distinguished Roman dynasty, a violent and aggressive soldier with a dubious reputation now become first Duke of Parma and Piacenza, the legitimised son of Alessandro Farnese, Pope Paul III he was assassinated at Piacenza one year after he took possession of the city. 2. Costantino Palumbo (1843-1928) Renowned pianist who had composed one only opera, a Maria Stuarda (1876) with a libretto by Enrico Golisciani that had been received cautiously at the S. Carlo in Naples but was far from a failure. 3. Arrigo Boito (1842-1918) Verdian librettist par excellence, the Palumbo text was begun in 1875, the year of the final realisation of his own Mefistofele, but taking advantage of the "poetic" pseudonym "Tobia Gorrio" that he used again the following year for the libretto of Ponchielli's La Gioconda. 4. Leopoldo Mugnone (1858-1941) Fêted conductor, studied at Naples Conservatorio and had links with Enrico Golisciani (librettist of Palumbo's Stuarda) he was a noted maestro concertatore as well as orchestral director and concerned at the Costanzi in Rome on the eve of Pier Luigi Farnese with reviving Gluck's Orfeo. 5. Alessandro Longo (1864-1945) Responsible for the vocal score. of Palumbo's opera. Professor of pianoforte at the Conservatorio di S. Pietro a Majella of which later he became Director. Founded the Rivista "L'arte pianistica". 6. Comparse and extras: The Royal families of Spain, and of Bourbon Two-Sicilies (Farnese heirs, legatees and descendents); Margherita of Savoy, Queen of Italy; Edoardo Sonzogno; Pius IX; Leo XIII. Palumbo's score is of long genesis and is notable for an ambition and force that presents a real challenge to performance. In 1891 as now, such a factor would indeed have been a tangible deterrent to any realisation - in Rome or anywhere else. The suave pianist had been a very late pupil of Saverio Mercadante in his declining years at the Naples Conservatorio and belcantist echoes are not rare in the music he offered to the savage historical drama master-minded with Boito. The music is often very fresh, energetic and rhythmically engaging but it readily displays a fustian affiliation, nearer, in fact, to a Neapolitan heritage than might have been expected from a composer of this date and sophistication at the dawn of Verismo. There are Mercadantian operatic tricks and quirks here and there - not disguised but almost outrageously exploited as if a figure from an historical past should be entitled to antique musical gestures however absurd this might appear. Questions about its genesis are legion. Who suggested the Farnese plot in the first place? Was it Boito in an access of modish anti-pontifical fervour? Begun in 1875 its plot would have been regarded as hot off the press. There were scores to be settled, revenge was in the air. Was there an anti-Bourbon recipe in the mix? Palumbo may or may not have been a fervent supporter of the extant régime - his patriotism in no way indifferent to a Neapolitan upbringing (he may or may not have been aware that his teacher had composed an honorific cantata for the wedding of the deposed sovereigns of the Two-Sicilies l'Olimpio ed il Walhalla with a feisty reception at the S.Carlo). The recent Bourbon presence in the celebrated Palazzo Farnese - in our day the French Embassy - in Rome may have contributed at least something to Boito's plot. All such factors are relevant to the surviving sources. These consist of the composer's autograph manuscript full score now held in the library of S. Pietro a Majella; the published vocal score created by his friend and colleague the pianist Alessandro Longo and widely distributed; and the Sonzogno printed libretto with its list of artists fated never to be heard in their roles. All three items are pertinent to the mechanics of the disaster: Mugnone's performance marks and signs on the full score (in blue crayon) stop abruptly at one precise moment at the climax of the first act finale: at the very moment when a furious Pier Luigi Farnese confronts the monks who are conducting Donata to the altar to take the veil. Farnese Tal beltà seppellita saria nel chiostro? Ah! no! In nome di Paolo terzo, m'ubbidite! Cappuccino Sposa è di Dio... sposa è di Dio! Farnese (furibondo) Di Dio rival sarò! Can it ever be imagined that such a scabrous confrontation could be enacted within sight and sound of the Vatican? Invoking a Pope in an abduction scenario? With a papal offspring declaring himself the rival of God? Clearly someone thought otherwise. Censorship struck, in the printed libretto the page that should have contained almost all this text is blank (the text on page 24 is extant, so is page 26, but page 25 is without text). All the material evidence is that this finale put an end to the rehearsals (and to the performance too). Sale of the vocal score was abandoned. To whom can this embargo be ascribed? The anti-pontifical movement - at its apex in 1875 - had been defused somewhat by 1891. Pope Pius IX, whose corpse had barely escaped being thrown in the River Tiber (in 1881) had been replaced on the triple throne by the far more adroit Leo XIII who promptly re-asserted the international nature of his reign, energetic contacts with Russia, Prussia, Germany, France, England etc., and an open negotiation with Vienna upon the possibility of removing the Catholic Establishment to an Austrian city by the new pope proposed a body-blow to the fledgling prestige of the Kingdom of Italy. Its monarchy, in the Pope's ex-palace, could only have raised its hands in horror at such a noxious confabulation in the opera house - Italy's most vociferous export. The Farnese royal descendents, entirely hostile to the Savoyard régime, would have been incensed, indeed up in arms. Who took the blame? No one it seems. Who spoke-up in defence of the abandoned score? No public statement was ever issued. Palumbo never wrote another opera, Sonzogno went on to other things, so did Leopoldo Mugnone. In 1891 Boito may have regretted this belated witness to his dishevelled (Scapigliatura) past. Who knows? As early as 1882 he had transferred his muse to Verdi and to international laurels. The composer remained silent. And so did the music. The provocations and challenges of the mischievous saltimbanco Grillo would fall on deaf ears for an indefinite future.